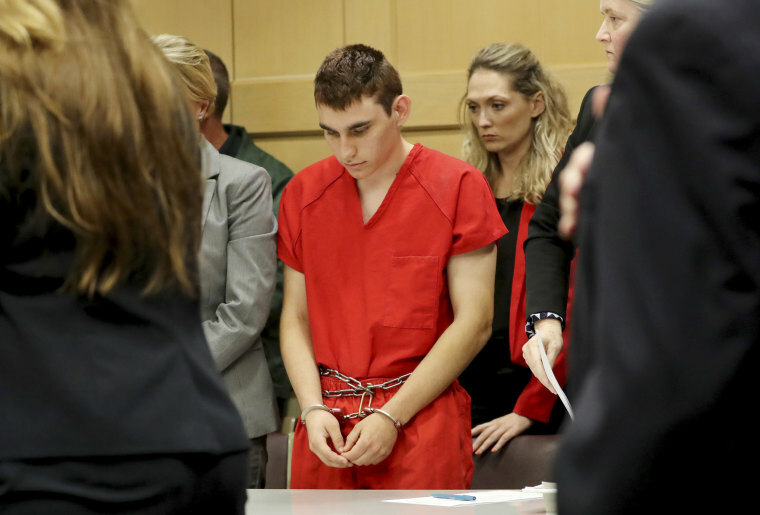 The person who called an FBI tip line in January said Nikolas Cruz made increasingly alarming statements after his mother died last fall, adding, "I know he's, he's going to explode." The FBI said last week that the information from the call was never passed along to agents in Miami "where appropriate investigative steps would have been taken." A transcript of the January 5 call, obtained by NBC News on Friday, revealed that the female caller, described by the FBI only as a person close to Cruz, never said that he planned to shoot up a school. Instead, toward the end of the somewhat rambling conversation with the FBI operator, nearly 14 minutes long, the woman said, "He's thrown out of all these schools because he would pick up a chair and just throw it at somebody, a teacher, or a student, because he didn't like the way they were talking to him. Um, I, I just think about, you know, getting into a school and just shooting the place up." Early in the conversation, the caller said of Cruz, "He's only 18, but he's got the mental capacity of a 12 to a 14-year-old." For a time, the caller said, Cruz talked about killing himself but "now he has switched it to, he wants to kill people." Cruz had used his mother's debit card to take money out of her bank account, bought rifles and ammunition, and posted pictures of them on Instagram, the caller said. "I just want someone to know about this so they can look into it," she said. "If they think it's something worth going into, fine. If not, um, I just know I have a clear conscience if he takes off and, and just starts shooting places up." The called also claimed Cruz was cutting up frogs and birds, saying at point, "I want to see what's inside." Several minutes later, the caller said, "I know he's, he's going to explode," according to the transcript. The caller said this information had been given to the Parkland Police Department before the FBI was called, but "I didn't hear anything." Broward County Sheriff Scott Israel said last Friday that his agency had received about 20 calls for service "over the last few years" about Cruz, but not necessarily in regard to a crime or requiring any further action by police. The Justice Department and FBI are investigating why the information from the call was never passed along to the local bureau. David Bowdich, the FBI's acting deputy director, said Thursday that the call center in West Virginia receives more than 765,000 calls a year. "It is not easy work," deciding which calls are worth generating leads, Bowdich said. But he added, "I'm not making excuses, because what happened was a tragedy."